Having been in private practice for over 30 years, Dr Lefland has the experience and knowledge to properly evaluate your eyes and detect and treat various visual and medical conditions As a former educator, he will take the time to explain the results of your eye exam, describe your options and listen and respond to any questions you may have regarding your eye care needs at TotalVision Eyecare Center in North Haven, CT.
Lawrence Lefland, M.S. Ed., O.D. Dr. Lefland attended Queens College, City University of New York, where he majored in Biology and received his Bachelor of Arts degree in 1973 and his Master of Science in Education degree in 1976. He attended the Pennsylvania College of Optometry where he was granted the degree of Doctor of Optometry in 1981, and received the Alumni Association Award for Outstanding Scholarship. Dr. Lefland completed clinical externships in the areas of contact lenses, pediatric optometry and low vision. He has served as an Industrial Vision Consultant and has participated in several clinical research programs involving extended and daily wear contact lenses. 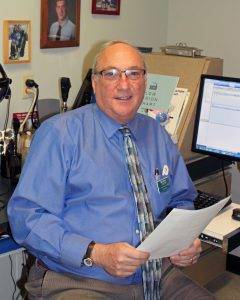 In 1982, he opened his private practice in Hamden, TotalVision Eyecare Center. In 1998 the practice relocated to a larger facility in North Haven, CT.
Dr. Lefland is a past President of the Connecticut Association of Optometrists. He is a member of Beta Sigma Kappa, the international optometric honor society, the American Optometric Association, and the American Public Health Association. He is certified in Advanced Optometric Care, the highest level of licensure for optometrists in Connecticut. He was honored in 2003 as “Optometrist of the Year” by the Connecticut Association of Optometrists, “for service to his profession, to his community, and to the visual welfare of the citizens of Connecticut.” In 1999 he received the George E. Comstock, O.D. award for distinguished service to the profession. In 1996 and again in 2006 he received the President’s Award for his continuing service to the Association. He has served as adjunct faculty at Quinnipiac University and as a consultant with First-Insight, a leading optometric software developer, assisting in the development of their electronic medical record (EMR) software module. In 2012 he was appointed by Governor Dannel Malloy to serve on the Connecticut Board of Examiners for Optometrists. Residing in North Haven with his wife Ilene and their two children, he enjoys tennis, skiing and classical music. For three years he served as Scoutmaster of Boy Scout Troop 41 in Woodbridge, CT.